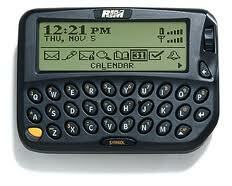 RIM introduces the BlackBerry. The original BlackBerry devices were not phones, but instead were the first mobile devices that could do real-time e-mail. They looked like big pagers. I should know. I had one on my hip for two years while working at Anheuser-Busch in the early 2000’s. In 2001, I visited the BlackBerry production facility in Waterloo, Ontario, Canada. It was surprisingly small at the time. They way I heard it, the name “BlackBerry” came from the similarity that the buttons on the original device had to the surface of a blackberry fruit. Those crazy Canadians!